In order to improve water quality in the Baltic Sea, a research project for innovative water oxygenation is run by the University of Gothenburg. The wind-driven pumps are held in place by a spring construction from Lesjöfors. During 2009-2011 the project BOX (Baltic Deep Water oxygenation) is run by the University of Gothenburg. The project aims to increase the oxygenation of the sea water in the Baltic Sea and thus obtain healthier water with lower phosphorus to reduce cynaobacterial blooms and increase opportunities to fish and vegetation in deeper water. 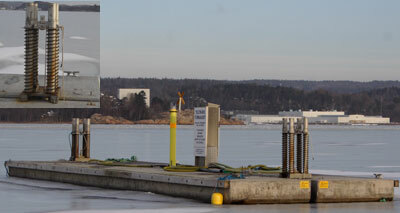 In a first step, the project has conducted tests in Byfjorden outside Uddevalla at the Swedish west coast, where oxygen defiance easily occurs due to a limited flow of water and a high proportion of emissions that require oxygen to decompose. Through two wind-driven pumps, oxygen-rich surface water has been pumped down to the deepwater, which has increased the circulation of sea water. In the process of installing the sensitive pumps, Lesjöfors assisted with information and advice for the best spring solution to reduce the strain on the pumps. – We are very satisfied with the service and the advice we received from Lesjöfors. The springs delivered works in a highly satisfactory way, “says Bengt Liljebladh, researcher at the Department of Earth Sciences at the University of Gothenburg.